In ongoing work to identify how genes interact with social environments to impact human health, UCLA researchers have discovered what they describe as a biochemical link between misery and death. In addition, they found a specific genetic variation in some individuals that seems to disconnect that link, rendering them more biologically resilient in the face of adversity. Perhaps most important to science in the long term, Steven Cole, a member of the UCLA Cousins Center for Psychoneuroimmunology and an associate professor of medicine in the division of hematology-oncology, and his colleagues have developed a unique strategy for finding and confirming gene–environment interactions to more efficiently probe what he calls the "genetic haystack." The research appears in the current online edition of Proceedings of the National Academy of Sciences. Using an approach that blends computational, in vivo and epidemiological studies to focus their genetic search, Cole and his colleagues looked at specific groups of proteins known as transcription factors, which regulate gene activity and mediate environmental influences on gene expression by binding to specific DNA sequences. These sequences differ within the population and may affect a gene's sensitivity to environmental activation. Specifically, Cole analyzed transcription factor binding sequences in a gene called IL6, a molecule that is known to cause inflammation in the body and that contributes to cardiovascular disease, neurodegeneration and some types of cancer. "The IL6 gene controls immune responses but can also serve as 'fertilizer' for cardiovascular disease and certain kinds of cancer," said Cole, who is also a member of UCLA's Jonsson Comprehensive Cancer Center and UCLA's Molecular Biology Institute. "Our studies were able to trace a biochemical pathway through which adverse life circumstances — fight-or-flight stress responses — can activate the IL6 gene. 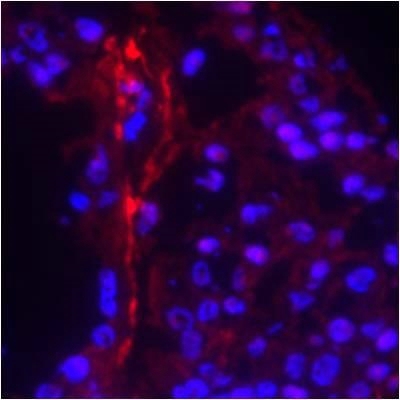 "We also identified the specific genetic sequence in this gene that serves as a target of that signaling pathway, and we discovered that a well-known variation in that sequence can block that path and disconnect IL6 responses from the effects of stress." To confirm the biochemical link between misery and death, and the genetic variation that breaks it, the researchers turned to epidemiological studies to prove that carriers of that specific genetic variation were less susceptible to death due to inflammation-related mortality causes under adverse social-environmental conditions. They found that people with the most common type of the IL6 gene showed an increased risk of death for approximately 11 years after they had been exposed to adverse life events that were strong enough to trigger depression. However, people with the rarer variant of the IL6 gene appeared to be immune to those effects and showed no increase in mortality risk in the aftermath of significant life adversity. This novel method of discovery — using computer modeling and then confirming genetic relationships using test-tube biochemistry, experimental stress studies and human genetic epidemiology — could speed the discovery of such gene and environmental relationships, the researchers say. "Right now, we have to hunt down genetic influences on health through blind searches of huge databases, and the results from that approach have not yielded as much as expected," Cole said. "This study suggests that we can use computer modeling to discover gene–environment interactions, then confirm them, in order to focus our search more efficiently and hopefully speed the discovery process. "This opens a new era in which we can begin to understand the influence of adversity on physical health by modeling the basic biology that allows the world outside us to influence the molecular processes going on inside our cells." Other authors on the study were Jesusa M. G. Arevalo, Rie Takahashi, Erica K. Sloan and Teresa E. Seeman, of UCLA; Susan K. Lutgendorf, of the University of Iowa; Anil K. Sood, of the University of Texas; and John F. Sheridan, of Ohio State University. Funding was provided by the National Institutes of Health, the UCLA Norman Cousins Center and the James L. Pendleton Charitable Trust. The authors report no conflict of interest.